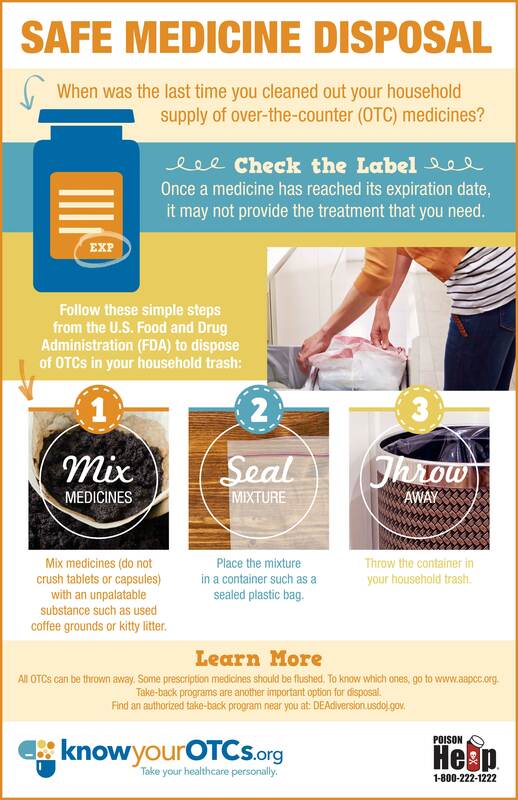 KnowYourOTCs.org wants to help you spread the word about safe use, storage, and disposal of over-the-counter (OTC) medicines. 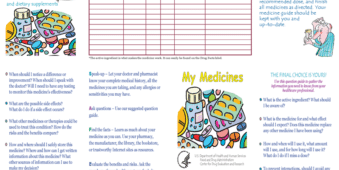 The materials below provide information to help parents, grandparents, and other caregivers safely store OTCs in their homes, and are available for you to order free of charge for display and distribution in your home, office, school, or waiting room. Additional educational tools in English and Spanish are coming soon! *For order quantities over 25, please contact akemper@chpa.org to place your order. Please allow up to 2 weeks for shipping. We regret that we cannot ship international orders. At least one tool must have a quantity to place an order. Approximately 60,000 young children end up in emergency departments every year because they got into medicines while their parent or caregiver was not looking. Know the facts. Order or download this Up and Away poster as a reminder to store medicines up and away and out of sight of children. Use this medicine guide to keep track of your prescription medicines, over-the-counter medicines, and dietary supplements. Sorry, nothing matched these filters.